Kids love noise and they always end up finding new ways to create a ruckus at home! As a parent, this may sometimes make you irritated, but nonetheless, you should let them create as much sound and noise as they can. A great way to encourage your child to do so is to let them use musical instruments. You can create your own musical band with items that can be found around the house or bought in stores. This is a great way to encourage a love for music and hone your little ones’ imagination and creativity. 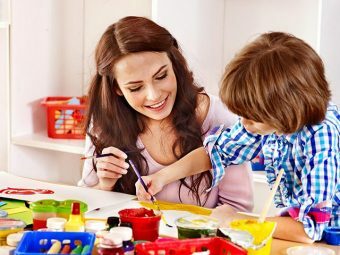 Crafting homemade musical instruments with your little darling is also a fun way to spend time and do something creative and special together! 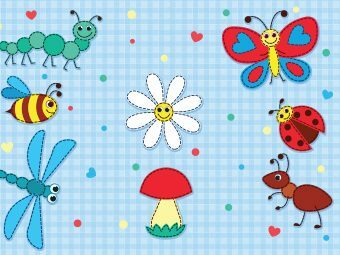 There are plenty of ways to create musical instruments using little knick-knacks that you do not have any use for. 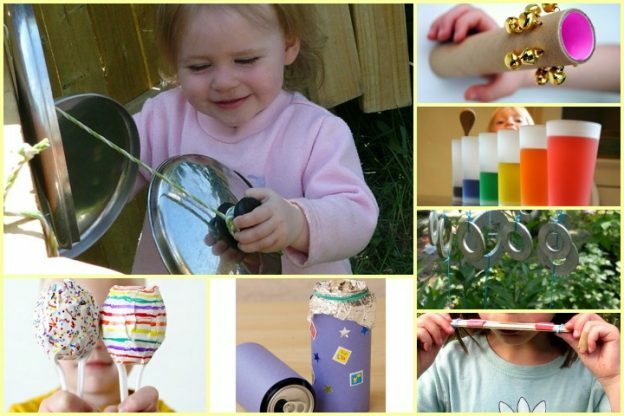 You will be surprised at some of the things that you can use to create fun instruments with your little one. Many of us often keep plastic eggs from last Easter and do not know what to do with them. Well, here is the perfect way to reuse them! All you and your kid need to do is collect pebbles from your garden. Put them inside the eggs. Get some tape to make sure that the eggs do not open while you are shaking them. You can redecorate the eggs if your kids want to add their own special touch to their new maracas! Do you have old potato chips or oatmeal cylinder containers? If yes, your kid will love a crafts project turning the containers into drums! He can cover the cylinder with a construction paper and decorate it as he likes. The next step is to make the skin of the drum. Encourage him to experiment with different types of materials to create diverse sounds -aluminum foil, fabric and paper can be used. Get him two pencils and shoot him with your camera, while he bangs away on his new drums! Get metal washes of different sizes, a ruler and some yarn, preferably of eye-catching colors. Cut lengths of the yarn and tie them to the ruler, keeping space in between. You can make them more secure by taping them to the ruler. The next step is to tie the washers to the end of yarns and make sweet music! This is a simple one as all you need is an old shoebox, glue and rubber bands. The first step is to cut a hole on the shoebox’s lid. Glue the lid in place to the box. Once it is dry, take the rubber bands and stretch them across the box. Your little one can now play the guitar by strumming the bands that are across the hole. 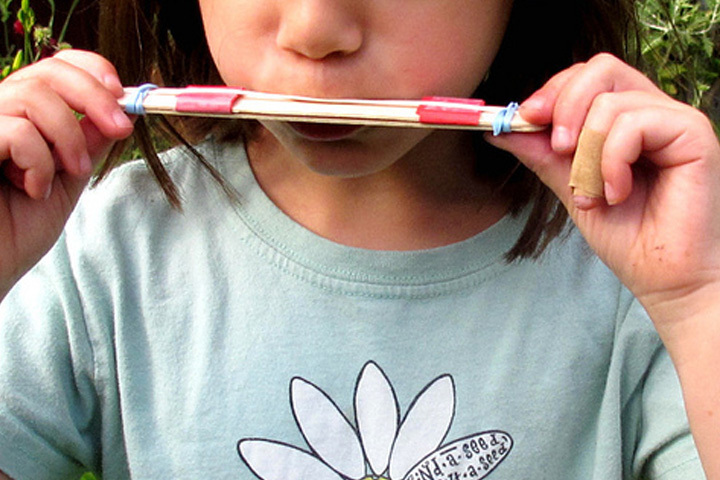 This one is the most simplest musical instrument craft for kids. 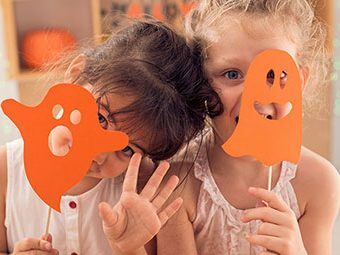 You can use an empty paper towel or toilet paper roll to make a horn for your kid to play with. All you need is the roll, a rubber band and wax paper. The first step is to poke or punch holes in a straight line down the roll’s length. One end of the roll will now need to be covered with the wax paper and tied securely with the rubber band. Your little one can sing into the open end while covering different holes with his or her fingers. All you need is a few glasses of the same size, food coloring, a spoon, and of course, water. Fill the glasses with different amounts of water. Add food coloring to give each glass its own unique color. The different levels of water will give out different sounds. This will definitely fascinate your kid once he starts to tap the glasses with the spoon! All you need for this one is an old cardboard tube and few jingles! Take a cardboard tube and pierce it to make holes with equal spaces in between. Now, get some jingles and attach them to the tube using a needle and thread. Voila! You have a musical instrument that is quick, easy and cheap to make! To make this instrument, you will need a cylindrical container with a lid. You could use something like a potato chip or oatmeal container or old soda cans. You will also need crayons, glue, construction paper and clean pebbles or dried beans. Cover the cylinder with the construction paper. Decorate it the way you want with the crayons. Put in the pebbles or beans and close the lid, making sure that it stays closed by gluing it. Once it is dry, your little one can play the new instrument. The first thing is to get combs of different colors and wax paper sheets. Fold the paper over the comb’s teeth. Make sure that the amount of paper on each side is equal. The side of the paper that has wax should face away from you. It is ready to be blown by holding it with the teeth facing upward. This is one of the easiest crafts to make musical instruments. You will need two pot lids and a length of ribbon or yarn. All you need to do is tie the yarn or ribbon around the lids’ handles and you have cymbals ready to play with! It is not difficult to get your kids to create their own musical instruments at home. 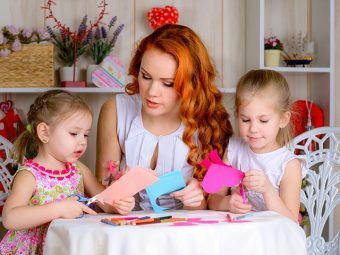 Encouraging your kids to make crafts and use their creativity will keep them busy and gives them a hobby that will help in developing their love of music. So, get crafting with your little ones and make some beautiful music together! If you have more ideas for creating musical instrument crafts for kids, don’t forget to share with us.